The Daniells family circus pulled back into town last night from a twelve-day road trip to a family reunion centered around my Grandmother’s 90th birthday in Long Beach, California. Altogether, we spent roughly forty hours in “Brian” (our affectionately named Ford Expedition that used to belong to the Milliner family), logging more than 2500 road miles. Overall, the trip was wonderful but needless to say, it wasn’t always rainbows and butterflies. In fact, I don’t think I witnessed a single rainbow and the only butterflies I saw were just washed from my windshield. Two of the low points of our trip are similar in nature: First, Brian ran out of gas on the way down. 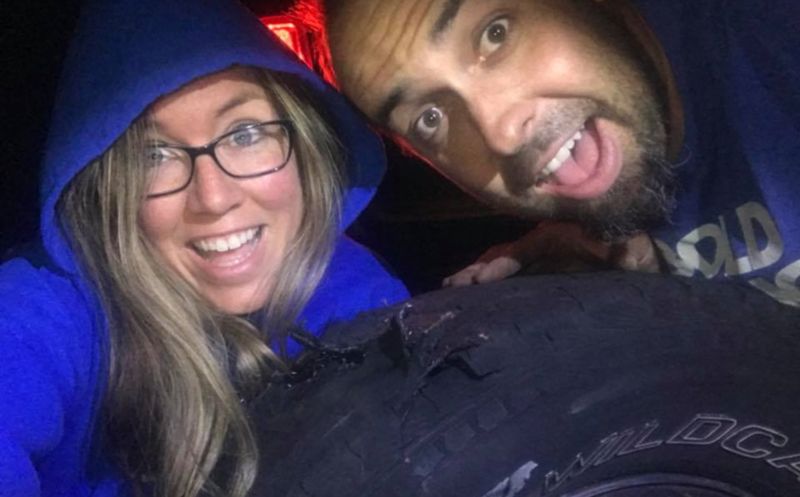 Second, on the way back up, Brian, in the middle of the night on our anniversary and in heart-pounding fashion, blew a tire. In fact, I kid you not, the very moment Annette and I had finished saying “I love you” to one another, we heard a loud whack and Brian started to rumble. I immediately thought how glad I was that if I was about to die, the last thing I uttered was that I loved my wife. In case you’re wondering, we didn’t die. 🙂 But we did do some living. What could have been an angry and frustrating night, served to remind me of the blessing of marriage. Genesis 2:18 says, “Then the Lord God said, ‘It is not good that the man should be alone; I will make him a helper fit for him. '” At 1:30am, Annette helped me change a tire but first she helped me change my perspective. She helped me shift from thinking, “I can’t believe this is happening in the middle of the night with six little children needing a bed,” to seeing our circumstance as an adventure that me and my lifelong helper/partner were navigating. Because of this change of perspective, and the fact that I’m married to a spectacularly incredible woman, we were actually able to enjoy this little trial.